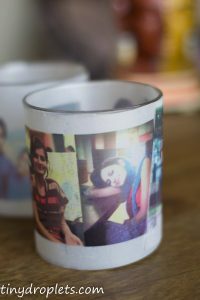 In my free time I love to look at my old photo albums, they not only remind me of people but also of the beautiful memories of those days..Photos are everyone’s favorite possession these are wonderful moments captured on a paper..
Its weekend again and this time we have a get together at my place, this morning I have been thinking of decorating my place in a different style. When I was looking at my drawing room I observed the area which was ignored always and it’s the table space, whenever I looked at it I always kept pondering over ideas that can make table space look as the most elegant area but failed to come up with something exciting. Finally I stumbled upon a fun, easy, and inexpensive way to create a personalized decor piece that’s perfect for a centerpiece during a special family meal, or just to lighten up during night time. I have been making many projects using old time pics. Among other thing that I still love, what I love is having flickering candles on the table. Here is an elegant piece of art created using meager items. These are glowing photo luminaries. 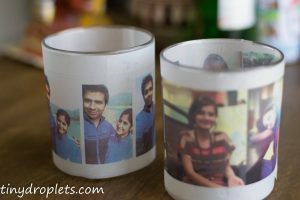 For making such a beautiful luminary one for yourself, things that you need to collect are scissor, both sided tape,wax or butter paper and glass tumbler of different shapes and sizes. Glass mason jars, flower vases, and pots work great. Try however, to avoid irregular shapes. Squares will work, but the best ones are smooth cylindrical shaped glass. I found few glasses at my disposal which I used in my project. 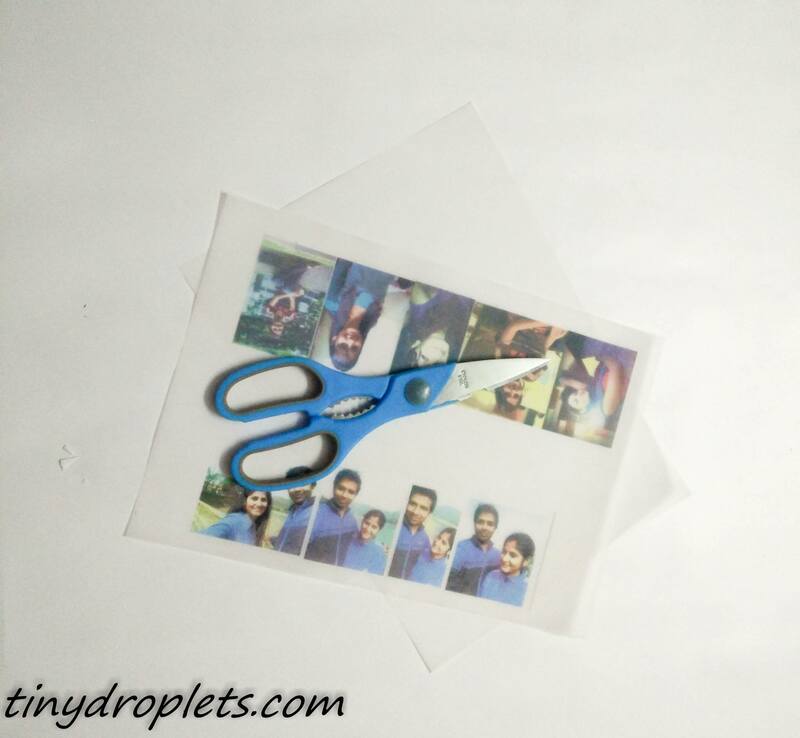 When you look at the pic above you see photographs printed on a translucent paper. All that I have done here is collected pics taken throughout the year and used my photo printer to print some of my favorite family photos onto wax paper. You might have to experiment with your own printer to make sure it can print onto wax paper, but most inkjet printers should work. First take a print for testing and make out whether the ink is spreading out or not. All that I did here was select some pics and make a collage. 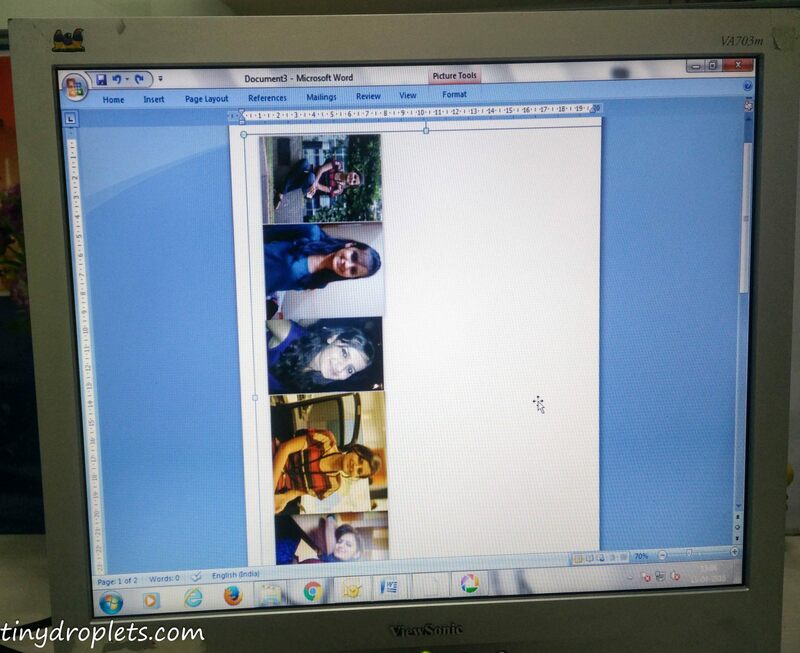 Once I have made a horizontal collage I saved it and imported it to word. I changed the opacity of the pic little bit so that the image can get a washed out look. I didn’t use washout feature directly as the pic gets too light shaded and wont look good when printed. Once I was done with the editing I printed the pics on a wax paper, I used A4 sized paper and it easily passed through the printer. 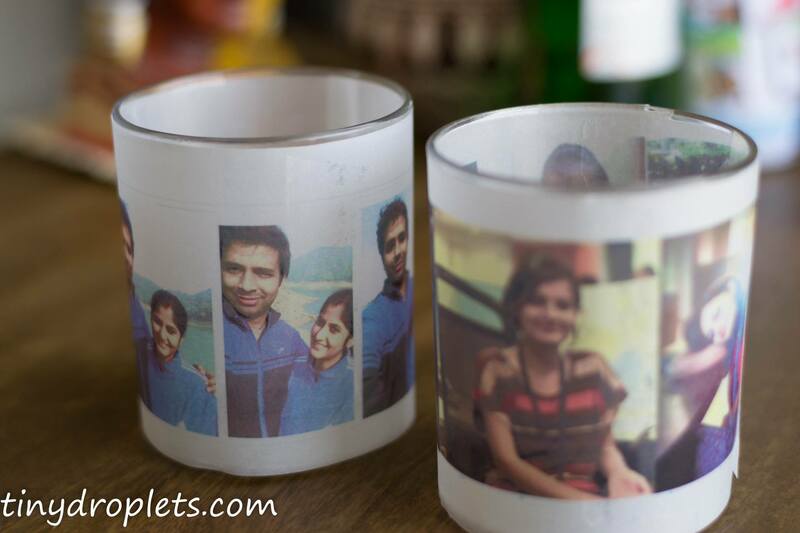 Prints looked as shown. Trim your photos to the proper height of your glass. I left some space at the edges. 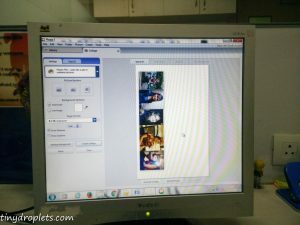 Before taking the printout make sure the exact size that would fit to the glass tumbler. Make sure you have clean wiped the glass. Take the both sided tape and start sticking it to the glass . 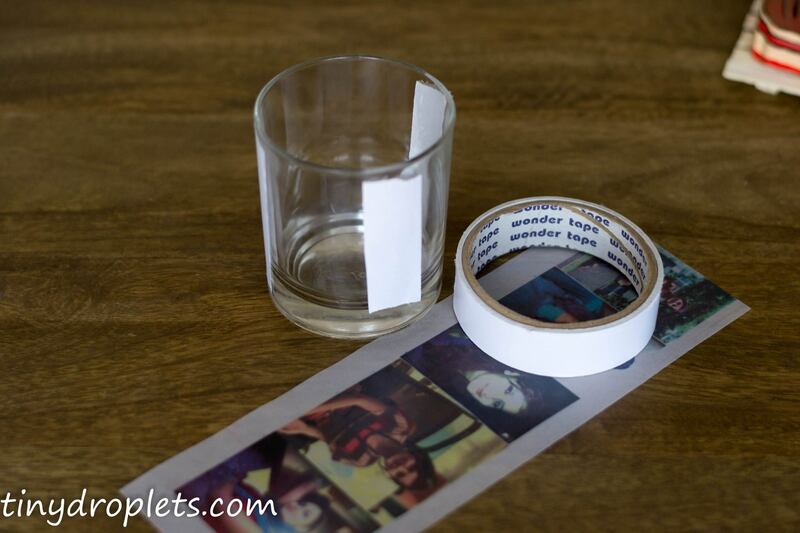 Simply attach your photo to the tape. 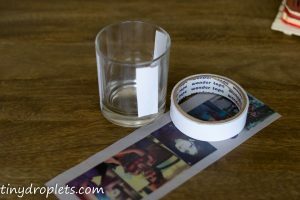 For larger containers, you’ll need more than one photo to cover all of the sides. Just have them meet right up in the middle of the tape for a seamless look. Photo collage fits best. The fun part is that these little luminaries look beautiful in broad daylight. Set on a windowsill or on a table, the light pours through them and naturally makes them glow! 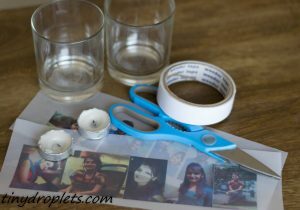 I used cylindrical glass but you can play around with a variety of sizes and group them together for a fun display. Its not only going to be beautiful display but at dinner this would also be the topic of conversation. 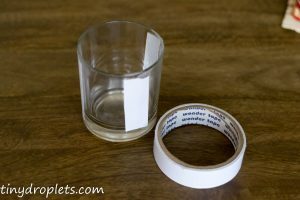 If you have a crazy obsession with scented candles, these little glass jars work beautifully for this project. The lower the candle wax, the better, so if you’ve got some almost-empty ones, they’ll work perfectly! 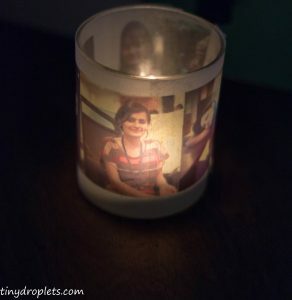 Apart from candles you can also use a battery-powered tea light and use these for night lights! The real magic happens when the lights go dim, and the candles start burning. Place a few tea lights in your glass containers and see the hue around you. The soft light pours through the wax paper and illuminates the photos, creating a beautiful work of art! 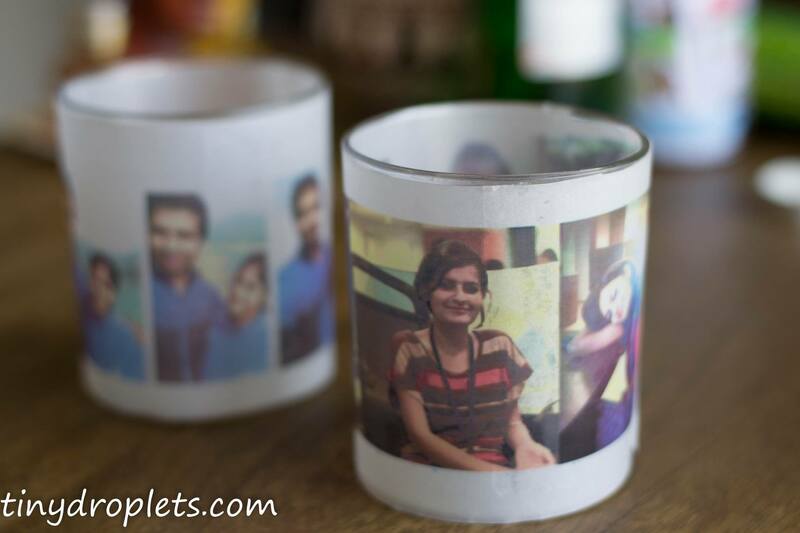 The translucent paper gives an awesome effect to the candle lit tumbler. I lit the dinner table with these glass tumblers and people couldn’t stop looking at them and admiring them. 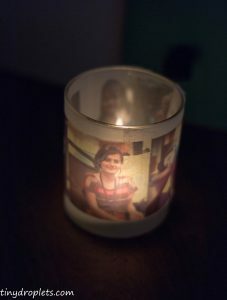 Start thinking about your own family memories you could light up! 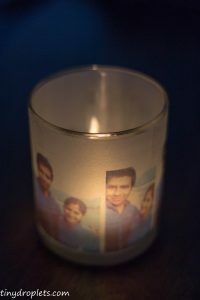 Candles does the trick and everything come alive with a flickering glow.